We have supplied farm sheds, storage sheds, garages, industrial sheds, barns and even aircraft hangars to our many friends in the Perth area. No matter what the size, shape or usage, they all have one thing in common: they should be laid on a concrete slab. From time to time, we get phone calls asking how to remove stains from the concrete floors. Since we use sheds for so many different purposes in Australia, we field questions about a lot of different stains and different situations. We thought it might be helpful to share some solutions with you here. Whenever you have a spill on concrete, the worst thing you can do is use a cloth with a wiping motion. Wiping spreads the spill and drives it deeper into the “pores” of the concrete. It is much better to blot any spills with paper towels or rinse them off with a hose. 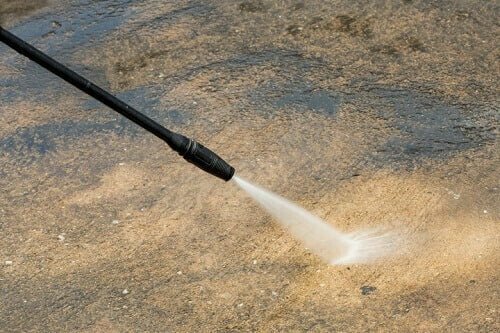 A pressure washer can be used to great effect on many stains. If you really want to stay on top of things, stock your shed with cleaners that are appropriate for whatever you are going to be using inside of the shed. Since traditional scrubbing isn’t as effective on concrete as on other surfaces, it is important to use the most effective cleaner for any spill. A poultice is another technique that works on concrete. You mix a cleaning chemical with a substance like cat litter that will absorb everything from the concrete. The chemicals break down the stains and the cat litter absorbs the water by osmosis. Without going too deeply into the science, suffice to say that the process is extremely effective and requires almost no work on your part. Be careful and judicious in the use of chemicals, especially acids. They can be dangerous, especially if your shed isn’t ventilated well enough. Always follow all manufacturers’ directions on the labels of any and all chemicals used for cleaning. The best way to remove chewing gum is to use ice on it first and pull or scrape as much as possible off. Then you create a poultice using methylated spirits. Then, use a wire brush or stiff bristle brush, followed by hot soap and water, followed by rinsing. You can also use a solvent such as amyl acetate after scraping off as much of the gum as you can. Another thing you can do is a very hot steam cleaning. These can usually be removed by scrubbing them with soap and water. If that doesn’t get all of the stains out, try a bit of chlorine bleach. For large areas, a steam cleaner may work better. Coffee stains can also be removed by scrubbing vigorously with soap and water in most instances. If that doesn’t work, try mixing one part glycerol with four parts water and making a poultice. Let the poultice sit for 24 hours. If the remains of the poultice give you any trouble, use an abrasive cleaning powder. Fungus is easy; it is a colony of microorganisms which are easily killed by chlorine bleach. After a couple of days, you can remove the residue with a stiff-bristled broom or brush. These can both be difficult. The first thing to do is use cat litter or any similar substance such as sawdust or even sand or dirt. These will soak up the lion’s share of the oil or grease. Then, try to use a degreaser that is specific to the product you spilled. If the paint has already dried, scrape off as much as you can, then apply a commercial paint remover. Make sure to follow instructions and make sure your shed is ventilated really well to avoid the fumes of the paint remover. Wet paint will involve blotting it up with a cloth. Abrasive powder will remove water-based paint, but you will have to let oil-based paint dry and use paint remover.